Regain your sanity by decluttering & organizing your home. With these simple DIY home organization ideas & tips, learn to keep only the things THAT MATTER. Our homes are FULL of stuff. Of course, a home is supposed to be a place to put all your things, but it’s also supposed to be a place for you to retreat from the daily grind and find some peace. However, many of us feel burdened and overwhelmed in our homes. Too much stuff in too many places causes stress and makes it problematic to find what you want. So, let’s clear out some space with these tips on how to declutter your home! That way everything has its proper place, allowing you to better enjoy everything you have and to find some respite from the disarray of modern day life. Before you start rearranging, consider how much of this stuff you actually need. Over the years, we frequently build up a sizable collection of things which once had utility but now just take up space. Haven’t worn that sweater in two years? How about that inherited old set of china that you never use? 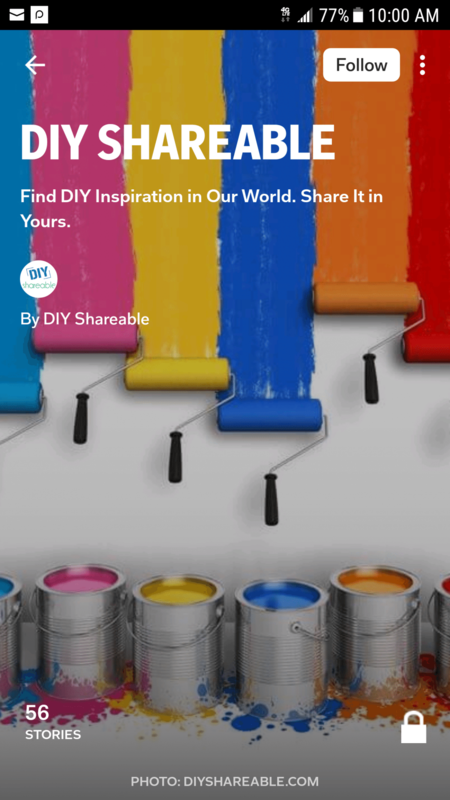 As you go incorporate some of these DIY home organization ideas below, these 3 questions should be top of mind at all times. Here’s another idea to help with the process: hang hangars backward in your closet. Every time to wear something and replace it, turn the hangar around. After a year, get rid of anything still hanging on a backward hangar. Still have things in boxes from when you moved 5 years ago? Are you sure there’s anything you really value inside? You put them “temporarily” in the basement with the best of intentions, but doesn’t the fact that you haven’t looked at them since say something? If you’re doing a serious clean-out, set up three stations: things to keep, things to store, and things to throw out. If you’re doing a large number of items, you’ll want to move this outdoors. Using these stations lets you see exactly how much you’re keeping and throwing away. If the throw away pile is tiny, you know you need to be more discerning in your sorting. Now that we have a more manageable number of things, let’s impose some order on them. Home improvement stores offer a variety of affordable, unfinished wood boxes meant for use in rough places like basements and garages rather than in finished spaces like living rooms. However, with a bit of work, these items can be transformed into attractive accessories which might contain magazines, blankets or any number of other sizable items. The trick is to make it look less practical, and in this example the focus is filling in the handle cut-outs with wood filler, then installing an antique-looking cabinet pull over it. Other accessories could be added as well. The box can also be stained. It’s amazing how much of a difference a couple coats of stain can make for any wood item. More details here. Shelves often waste a lot of space, particularly when you’re storing short items. Make better use of your space by storing things under the shelf as well as on top of it. Start with clear glass or plastic jars with wide screw-top lids. Baby food jars are great, as this trick is commonly used for collections of very small items such as bolts and screws. Nail or superglue the lids to the underside of a shelf. Fill the jars with items, then screw them into the lids for storage. Home office desks, bathroom counters, and other horizontal surfaces commonly build up a varied collection of small objects. Too often, they all get swept into a crowded and tangled “junk drawer,” making it difficult to find anything. The whole point of DIY organization ideas is to give things a proper place. In this case, we need multiple small containers in which to separate and store items. You might use glass jars, tin cans, plastic bowls, small cups, even lengths of PVC piping cut to the exact length you need. Spray paint all of them to give a united look, then decorate to taste. You can easily create patterns with scraps of decorative paper, fabric, leather, yarn and more. Finally, secure them all to a piece of wood so your organizer stays together. See more here. Ever seen one of those cute roll-up caddies for make-up brushes? They’re great because they don’t let the bristles press against the sides of a container, deforming them. Here is a way you can make one for yourself from a sushi mat and some elastic. Basically, just weave the elastic between the bamboo slats of the sushi mat, skipping over a number of slats to create an opening large enough for each brush. You can tailor the caddy to your specific collection of brushes! For slightly larger objects, we have sewable fabric storage bins. As described here, they end up measuring 8.5” x 9” x 7”, but you can adjust the size of the material to make your finished bins larger or smaller. These fun little bins are made of two different fabrics, and they’re even reversible! Crafts rooms are a great place to use multiple fabric bins. Imagine having a shelf or two each holding a few of these bins…..you could even color code their contents. Or you could place one on your coffee table and collect all the random items that accumulate there, freeing up the rest of the table for, well, coffee! If fabric isn’t your thing, maybe weaving a basket out of paper appeals to you. You can use anything from bland packing paper to wallpaper or craft paper. First, fold the paper into strips and sew it into place. Then weave it just as you would a traditional basket. You could probably also do this project in fabric. Adding interface would certainly give it the necessary stiffness, but suitably heavy fabrics might work on their own as well. See tutorial here. Perfect for kitchens, dorm rooms or home offices, this customizable message center is just as decorative as it is functional. The tutorial uses 9 round cork trivets as its base. Of course, you can use more for a bigger message center. You can also use cork in other shapes. Art stores sell square cork tiles which can be cut with an X-acto blade. There’s three ways of preparing your cork pieces. The first is by covering it with fabric. The second is by quickly hitting it with spray paint. Both of these pieces can hold notes secured with thumbtacks. The third thing you can do with your trivets is to paint them with chalkboard paint, which will allow you to write on it with chalk (and then wipe the chalk away). Imagine every member of the family having one little chalkboard to themselves! Everyone could quickly let others know where they are as well as any important plans! Most of us stuff our necklaces into drawers of jewelry boxes, resulting in chains hopelessly tangled with one another. Have no fear because there are better options. The ideal way of storing necklaces is by hanging them individually, and you can make a very cute organizer in an afternoon. Just paint a length of wood and glue fun stones at regular intervals, with each stone holding a single necklace. The stones can be found in plenty of places. Some science and hobby stores carry them, and if you have a local geology shop, that’s ideal. More accessible sources are new age stores, which often carry a variety of rough cut and polished stones. You can also find them on Amazon.com. Just search for “raw stones” or “polished stones.” See the steps here. Make-up is difficult to store. You don’t want to stack it, because then you can’t see which color is which. Many of the cases are curved as well, making stacking pretty much impossible. But what if you could get them off the counter yet keep them in sight? The answer is to magnetize them. First, a cheap framed stock image is covered with a sheet of metal, which is then covered with an attractive fabric. Then, magnets are glued to the backs of each make-up container. The framed metal sheet is attached to the wall, and all of your make-up can hang on full display, yet not clutter your counter top. You can use this magnetic board trick for a variety of other items as well, such as spices in the kitchen, where you can stick your magnetized items to the fridge. As we continue to look at bigger items needing storage, it’s tempting to throw them all in cardboard boxes and call it a day…..right? But, what if our cardboard boxes didn’t have to look like cardboard boxes? Decorative paper and a few accoutrements can quickly dress up boring containers. You can even use it on shoe boxes. And because you’re using rigid boxes with lids, these containers are stackable, saving space. This is great for stuff you know you’ll need periodically but not on an everyday basis. Learn more here. This project creates the wonderful illusion of book stacks floating in mid-air. In truth, an L-bracket has been secured inside the bottom book. The books stacked on top of it hide where the bracket is fastened to the wall. It does require the sacrifice of one book per shelf. The bottom book will be unreadable by the time your project is finished. Just go to any used book store and pick up something for cheap that you would probably not read anyway. Also, make sure it’s large enough to support your other books. Anyone can buy conventional shelving units, but you can build a more creative system on which to display your treasures. This shelving project is made out of triangles. Just build as many as you want and install them right side up or upside down, your choice. They can be subdivided as well, creating different ways to organize smaller trinkets. More info here. 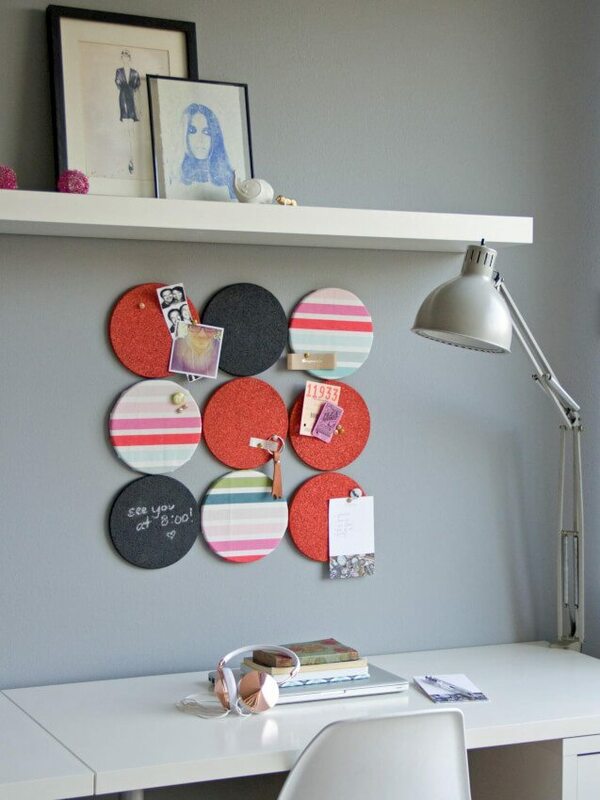 Bring a metal fence panel inside and quickly make a wall organizer for hangable things. This particular one was made using a hog panel purchased at a feed store but if you’re a city dweller, any metal fence or reinforcing panel from a home improvement store will do. Depending on space limitations, you can display it either horizontally or vertically. Fasten it to the wall with screws, then hang all of your “clutter culprits” from it with s-hooks and binder clips. This can be roughly used in a basement or garage, or you can even put it up in the kitchen for all your pots and pans. This coffee table offers three functions in one. First, it offers a surface for all the things you handle throughout the day, just like a normal coffee table. But it also offers a lower shelf for either display or storage of items. In addition, it offers an attractive depression in the center which can hold any number of decorative items. It’s built from four long wooden crates which are nailed together and stained. This tutorial also provides a link on how to transfer printed designs to wood using Mod-podge, which is used to further embellish this table. Caster wheels are secured to the bottom, making it easy to clean around, not to mention relocate if you rearrange your living room. Another place where tons of space is wasted are closets. A partial answer is to build a shelving system, but that only addresses part of the space. Take it a step further and attach shelving to the back of the door, so it’s unseen when the doors are closed. These shelves might not be very deep, but since they can stretch the height of the door, there’s still a lot of space to be reclaimed. This shelving unit will require caster wheels if you’re planning on loading it up with anything heavy. Be sure to get a good set of them so they properly glide when you’re opening and closing the doors. No matter the time of year, now is always a great time to start cleaning up old clutter and organizing the things that matter. Consider a few of these DIY decluttering tips and put a personal touch on your home organization!